Edmund Blackstone, Bow Street Runner, poured ale over his clothes, and rubbed his fingernails against the stone wall until they were cracked and jagged. Then he dishevelled his hair, rubbing a little grease into it. The whole process offended him but he persevered, massaging soil into his hands until they had a dirty polish about them, yet still they didn't have the saddle-hard palms which you got wielding a shovel for twelve hours or more every day. For that was what he would have to do - Edmund Blackstone, navigator or navvy. 'Who's Petro?' Blackstone asked. Although he knew. But how else, Blackstone wondered, was he to discover who was behind the theft of the navvies' wages? Who stood to gain if the world's pioneer public steam locomotive railway, the Stockton and Darlington, failed to open? In chasing the answers Blackstone unearths a plot to pull the world's first Great Train Robbery. Beau Blackstone is the third Blackstone novel. "A tale of murder, highway holdup, riotous goings on - and a plot to carry out the first-ever Great Train Robbery… There's enough excitement to raise a really good head of steam!" "A most unusual story, packed with exciting incident and peopled with plausible characters. You really should introduce yourself to this new hero, forerunner to all the fictional detectives that have ever entertained us." "An increasingly fascinating saga, set against the completion and the opening of the world's first public railway between Stockton and Darlington. The book contains a strong element of mystery, both ingenious and tantalising." 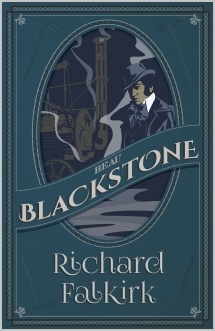 "Blackstone, a combination of Regency dandy and tough private eye, takes precedence." "Plenty of action and excitement, and good period background." "An exciting tale… the author has caught the atmosphere of the era. This certainly is a first-class adventure." "A thriller every inch of the way." "An exciting story set against the authentic background of the period." "Edmund Blackstone is the name. It has a good virile ring about it. Blackstone is fast on the draw with his flintlock and wields a nifty baton with the official crown on it, but when he wants to command the respect of a hostile crowd he'll slug it out with an adversary using his bare knuckles. Curiously in the pantheon of national heroes, from Robin Hood to today's detectives and secret agents, nobody had written about Bow Street Runners till author Richard Falkirk invented Blackstone and turned him into a world bestseller." "This Bow Street Runner who is rapidly becoming one of today's most popular fictional characters. Mr Falkirk, besides spinning a good tale, also gives us an intimate insight into life in the early 19th century." "This, Blackstone's third adventure, should satisfy everyone."